At any track and field competition, the relays represent an intricate and unique component of a largely individual sport. The relays—primarily consisting of the 4x100 meter and 4x400 meter events—are run in teams of four, with each member running an equal leg. Unlike all other open events, the success of a relay is largely contingent upon the equal success of each relay leg. Simply, a relay cannot find a desired competition result or high degree of success if each leg is not equally accounted and planned for. 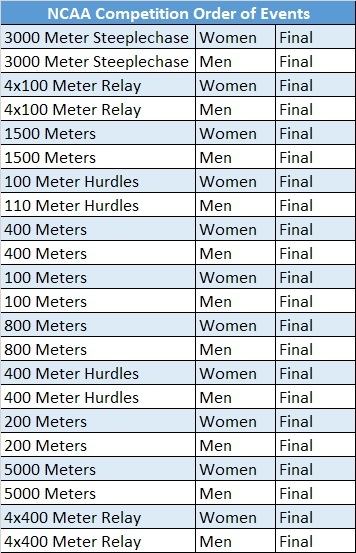 Following a NCAA standardized model for a competition order of events, the 4x100 meter relay will be the second event following the 3000 meter steeplechase and the 4x400 meter relay will be the culminating event of the day. 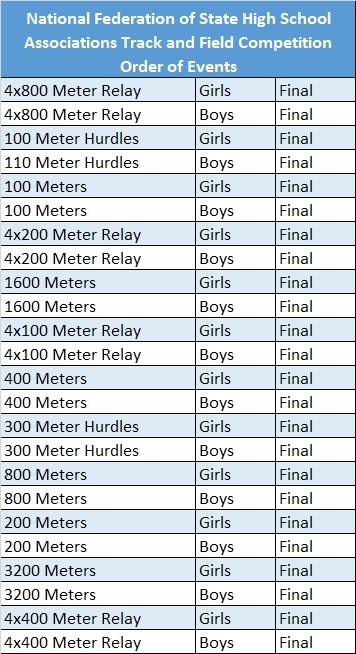 When following the National Federation of State High School Associations Track and Field standardized competition order of events, the 4x100 meter relay will commonly be in the middle before the 400 meters and after the 1600 meters and the 4x400 meter relay will be the culminating event of the day. The spacial designation of these two events allows for an individual athlete to potentially compete in both events. Who should I put on my 4x400 meter relay team? Each relay team should consist of the four best and fastest individual athletes. Given a definitive goal of running the fastest time possible, it is crucial that each athlete on a relay is chosen based on proven speed and previous competition results. While it is common for coaches to pick relay members based on external factors such as personality, commitment, or training age, it is crucial that the final decision—albeit taking these factors into consideration—is based upon achieving an eventual goal of competition success. Why is this section repeated? Because a relay—4x100 meters, 4x200 meters, 4x400 meters, or up—is only as strong and successful as the least capable leg. An athlete who may be inconsistent, non-competitive, or merely slower than the best and fastest runners on a team should not be selected for a competition relay. 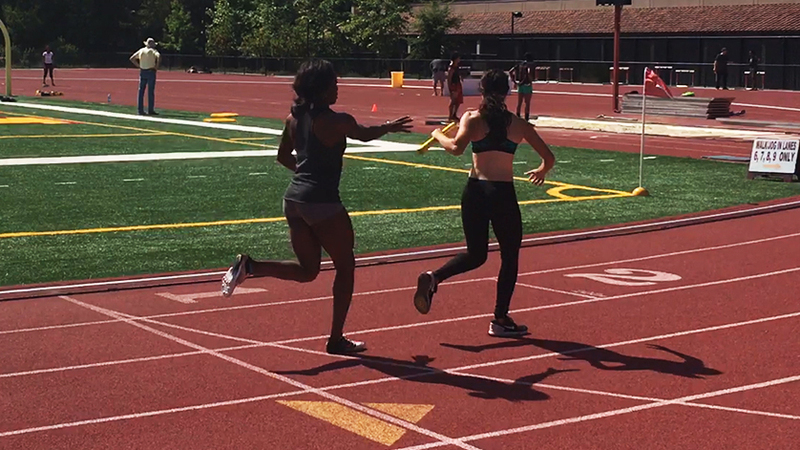 Although this concept may seem brash to new coaches, it is an important lesson to consider when composing and striving towards a successful and competitive relay team. With the final goal always being to gain a new personal-best time or top competition placement, it is the overall coaching process and training methodologies which truly make a difference towards this goal. The 4x400 meter relay should be comprised of the best and fastest athletes who have demonstrated—preferably in a competition scenario versus practice scenario—the ability to run a strong 400 meter race. Typically, 4x400 meter relay teams are comprised of athletes who specialize in the 200 meters, 400 meters, and 400 meter hurdles, but often see the inclusion of 100 meter, 100 meter hurdles, and 800 meter specialists. Most importantly, it is crucial to select relay runners who have demonstrated an ability to maintain composure and a high degree of competitiveness while in high-stress situations. 1st Leg Runner- The 1st leg of the 4x400 meter relay will begin from starting blocks. As such, the 1st leg of the relay ought to be your best starter or highly proficient at block starts and able to exhibit proper block clearance and acceleration mechanics. 2nd Leg Runner- The 2nd leg of the relay is responsible for receiving the baton in the exchange zone while within the designated lane and cutting in after one turn or 100 meters. This leg should be consist of an individual who will have the ability and skill to cut-in during traffic and expected relay congestion. The cut-in responsibility requires an athlete to be intelligent, yet aggressive—an athlete on this leg should exhibit both these qualities. 3rd Leg Runner- This leg is often comprised of either the fourth best or the most inexperienced athlete on the relay team. Although this designation may change due to ordering schemes, this leg is still responsible for receiving and handing-off the baton. 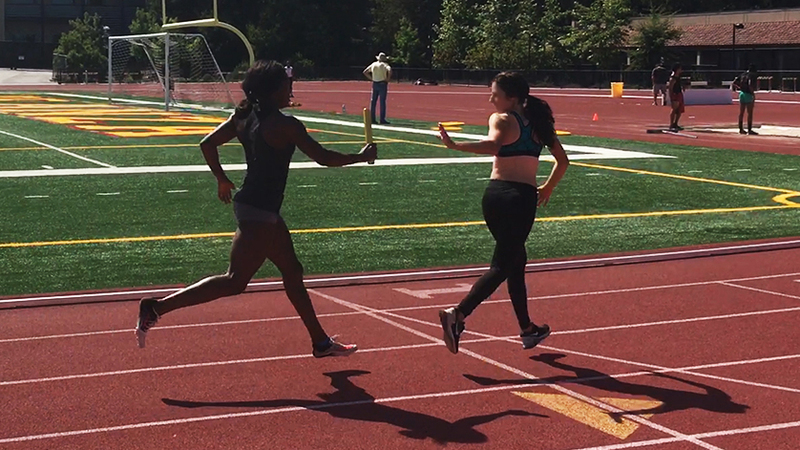 Due to general handoff congestion during all baton exchanges, the athlete on this leg must be able to maintain mental and physical composure during the exchange and have the ability to strongly accelerate out of the exchange zone. 4th Leg Runner- The 4th leg or anchor leg of the relay is considered by many to be the most important. As such, this leg is often comprised of the fastest and toughest athlete on the relay team. Although this may change with different ordering schemes, it is paramount that the anchor leg has a proven high degree of competitiveness, toughness, and an ability to stay calm under pressure. It is important that the athlete on the anchor leg has these qualities due to the necessity of having to either maintain a current lead or catch up to teams in front. Each leg of the 4x400 meter relay should hold the baton in their right hand. The baton should be firmly gripped near the base as to avoid accidental drops and to give the outgoing runner sufficient room to grab the baton. Although the 4x400 meter relay exchange is significantly slower than the 4x400 meter relay exchange, care should always be taken with both the incoming and outgoing runner in securing the baton. Each leg of the 4x400 meter relay consists of four equal lengths of 400 meters—with each athlete running the same distance. In parallel with the 4x100 meter relay, the starting or 1st leg of the 4x400 meter relay will employ starting blocks to begin the race. Following the 1st leg, the remaining 2nd, 3rd, and 4th legs will exchange the baton within the designated exchange zone—with the outgoing runner continuing to run their 400 meter leg. Where do you cut in? The 4x400 meter relay cut-in is located on the beginning of the backstretch and will be designated by cones, lines, or other visual markers. When do you cut in? The 2nd leg of the relay should cut-in after the third turn and after having passed the designated cones, lines, or visual cut-in marker. How do you cut in? Based upon simple geometric principles—the shortest distance between two points is a straight line. In a 4x400 meter relay, the 2nd leg runner will cut in once past the marked zone. Once past this marker, the 2nd leg should cut-in along a straight line from the current lane to the inside of lane one at the 200 meter mark. The 2nd leg runner should not cut directly in to the inside lane as soon as possible—this is a common mistake which will cost additional energy and may affect overall race position. The 4x400 meter relay handoff occurs within a strict 20 meter exchange zone. This exchange zone will be marked by two large triangles—one at the start of the exchange zone and one at the end of the exchange zone. A legal exchange, with the baton changing hands, must occur within this zone. The Incoming Runner- The responsibility of the incoming runner is to first-and-foremost maintain proper sprint mechanics while finishing their 400 meter leg of the relay. A severe deviation or breakdown in proper mechanics may lead to a difficult handoff or possible incidental contact with other relay teams. The incoming runner should maintain a firm grip on the baton—in the right hand—throughout the entire leg. Once in the exchange zone, the incoming runner will place the baton in the outstretched arm of the outgoing runner. 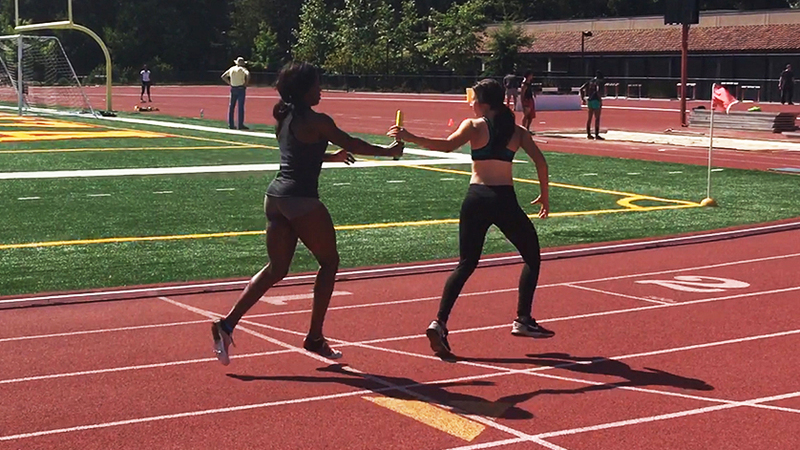 Although a verbal cue of "stick" or "hit" may be used, all 4x400 meter relay handoffs should be non-blind and a verbal cue is not necessarily required or needed. The Outgoing Runner- It is the responsibility of the outgoing runner to maintain proper physical and spatial position inside the exchange zone. The outgoing runner should align themselves as close to the inside of lane 1 as possible in preparation for the incoming runner. The outgoing should be positioned with their body facing towards the track, with their left arm outstretched to receive the baton once the incoming runner has entered the exchange zone. Once the incoming runner is within a few meters of the exchange zone, the outgoing runner should take two to three hard steps or side-shuffles in a preparatory acceleration for the handoff to occur. 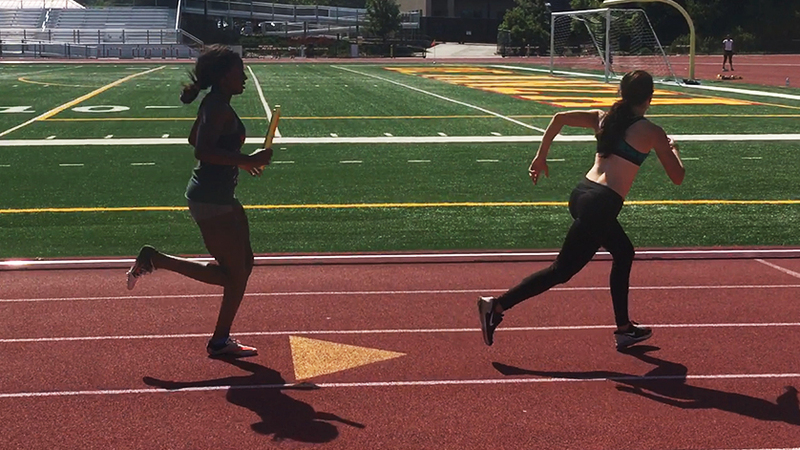 Once the incoming runner has placed the baton in the outstretched arm of the outgoing runner, the outgoing runner should immediately switch the baton to the right hand and continue to accelerate out of the zone and run their individual leg. In most 4x400 meter relay scenarios, an official will coordinate the 3rd and 4th leg handoffs and line the athletes up in descending order with the leading team being closest to the inside of lane 1. For the handoff between the 1st and 2nd legs, the baton will be exchanged within the specifically designated lane—with the 2nd leg maintaining their position within this lane until the cut-in.